Wow! What a day yesterday was! Lots of interaction and debate on Twitter about what is and what is not a makeover. Let me set my position: I think a makeover has to use the data provided and improve upon the original visualisation. Others use Makeover Monday as a playground to work with lots of different data or try new techniques. Those are all fine and dandy, but for me, a real makeover uses the same data as the original. Part of the discussion yesterday was about critiquing work others have submitted. I've shied away from this because I don't want to discourage anyone from participating. 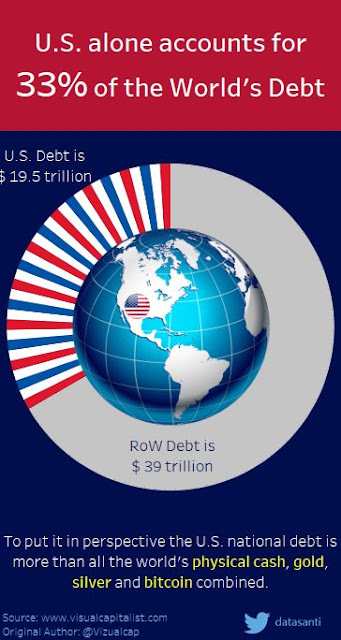 Fortunately, Santosh Patil has agreed to let me give his week 43 submission on US Debt a makeover. thanks Santosh! Does it need a dark blue background? This makes some of the text hard to read. What are the candy stripes for on the donut chart? What value do they add other than decoration? What's the purpose of the globe in the middle other than decoration? What purpose does it serve? Overall, there's just too much going on for me, for what is essentially two data points. Below is a ten step makeover I did of his work, starting with the original. Hopefully this helps you see how I think about data visualisation and the simplicity I think we should strive for.